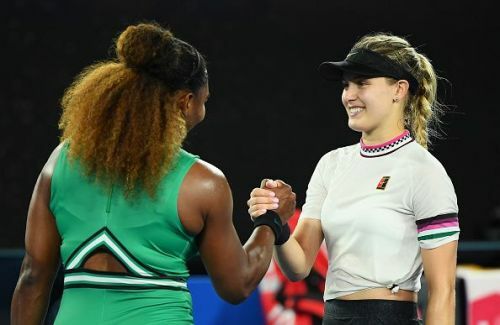 Eugenie Bouchard was in for a ride she could not control it her second round Australian Open encounter against Serena Williams. The Canadian won four games in the match but couldn't mount a challenge against the Williams who smooth sailed into the third round with 6-2, 6-2 straight sets win at Rod Laver Arena late Thursday night. It was another terrific performance from the American and a sad ending for the 24-year-old who was clearly outplayed. The American started the match with a bang as she raced away to a 3-0 lead to put the Canadian star under pressure right from the beginning. The 16th seed Serena conducted a strong serve before consolidating that with a double break against the Canadian. Just when it looked like it would be a slaughter for Bouchard, she surprised many by breaking Williams in the fourth forcing deuce before clinching the breakpoint. It started a series of breaks with Williams benefitting from her early push to hold in the eighth that gave her the 6-2 win in the first set in 35 minutes. Bouchard damaged her own game in the set committing two double faults and a second serve that Williams took full advantage of. Despite her service game not being any better than Bouchard’s the stance she created made it very important for the 24-year-old to get into the match or see it come to a close. Bouchard got into an early service hold situation with Williams who saw her own game challenged by the Canadian. When she leveled the score at tw-all, it was the beginning of the end as the momentum sat fully in the former world number one’s hands. She went on to control nearly every aspect of the next three games to lead 5-2 and serve for the match. Serena allowed Bouchard just one point before reaching match point where she put a winner far out of the Canadian’s reach and ended the match in 1 hour and 10 minutes. With the former seven-time champion into the third round, she’ll continue to show her strengths as she’ll face Ukrainian young gun Dayana Yastremska, who won over the 23rd seed C.Suarez Navarro on Saturday.